Imagine 4 P4500 Lefthand’s spread over 2 locations and operating in 1 management group and 1 cluster with Network RAID-10 (2-Way Mirror) Data Protection Level. How many managers do you need to keep the SAN operational in case of a disaster (destruction of 1 site)? The answer is 3. If you install a manager on every machine, you’re still 1 manager short in case of the disaster. It’s possible to use a virtual manager, but the SAN still goes down at the time of the disaster. The virtual manager can only help to start it again. The logical thing to do here, is to install a Failover Manager. Put this manager in a third location and you’re protected against a disaster in any of those 3 locations. For our pleasure, HP created a Virtual Appliance to be installed on a virtual platform. Download it here. In my case I used a simple HP ML110 G5 with 2x Intel Xeon 3065 CPU’s, 8GB RAM, 2x 500GB SATA disks and 2 GBit NICs with VMware vSphere Hypervisor (Free ESXi) as a dedicated server for the Virtual Appliance. And even that is overkill. You can easily make it work with 1 dual core CPU and half the RAM. Setting up the complete environment and integrating it into the existed infrastructure took me less then a day. 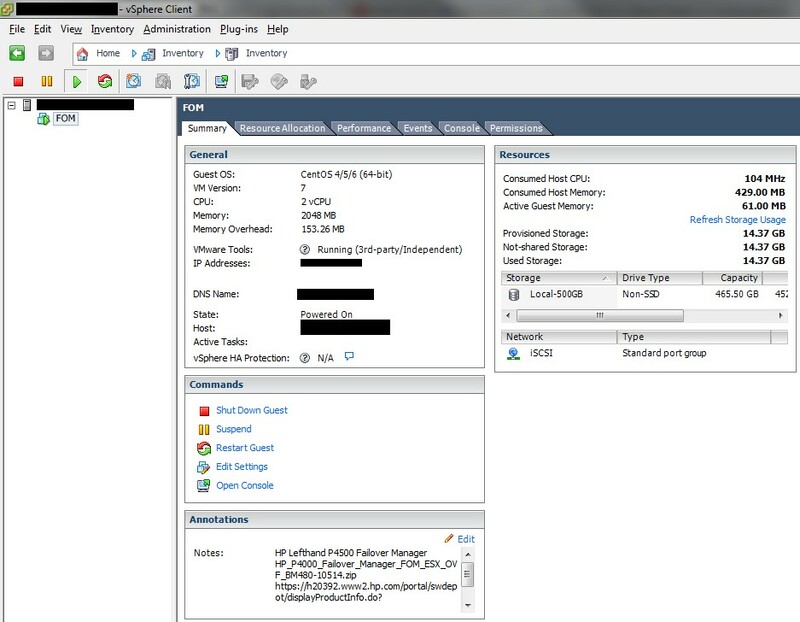 Configuring the Virtual Appliance is not a lot more then assigning an IP address. Thanks again viewers! Here’s the summary for 2011. I hope y’all have a blessed 2012! Madison Square Garden can seat 20,000 people for a concert. This blog was viewed about 68,000 times in 2011. If it were a concert at Madison Square Garden, it would take about 3 sold-out performances for that many people to see it.